That’s the one that was too big for any of the cages, cages – or hoops – being the only thing that can be done about floppy peonies. These subtle supports work very well, though the peonies do have to be pretty full before subtle is the word. I’m being fair and balanced when I mention the hoops, because once the plants get really hunky hoops are inadequate. Even the best are made to embrace a peony that’s no more than about 14 inches wide when the shoots first come up. 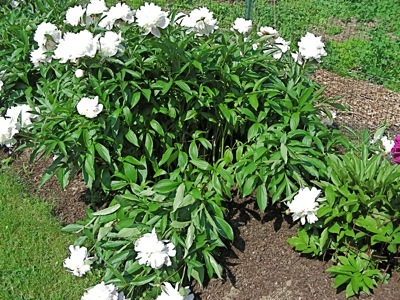 Well-established peonies that aren’t being divided every other minute are more like 2 feet wide or more. Thus the wisdom of our house’s previous peony tender, who left a supply of cages made out of decorative – I use the word advisedly – garden edging fence, the heavy wire kind that’s about 2.5 feet tall. Ours has scallops on the top and plainly came in a roll, but all that really matters is that it be stiff enough to stay curved when bent and to hold up heavy foliage, but pliable enough to bend as desired without special equipment. 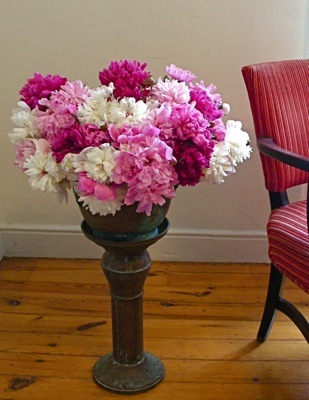 Cut generous lengths, so the frame can expand as the peony does, and don’t worry about the open seam. The stakes at the bottom that hold the fence in the ground are usually strong enough to keep it from splitting open, but you can tie it together with baling twine if you’re feeling nervous. The only hard part is that initial cutting. The wire is heavy enough and the cuts are many enough so a specialized tool is required – or a very strong hand with a hacksaw. And the cut edges are sharp, so they have to be bent back with pliers. We do our own repairs but I’d certainly hire it out if I had to make them from scratch. Not cheap. But ours must be at least 30 years old, so you only have to do it once and if you get sick of peonies you can probably sell them on e-bay. One tip for long term peony health: sooner or later, supported peonies are going to encounter a storm that breaks a lot of stems right were they meet the support. Temptation is to cut them off there and use them for bouquets. No problem with the bouquet part, but unless the stem is completely cracked open it’s better to cut farther up toward the flower. Even wounded, the stems and leaves you leave behind will continue to nourish the plant. The Other Alternative: Single or Japanese peonies. Gorgeous flowers, most of them on bushes that remain (more or less) upright with no help from you. This year I am using bamboo circled around the plant and criss crossed with string…I am hoping this will work well! 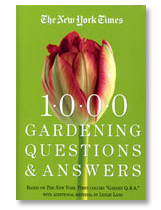 I put one sturdy wood or bamboo stakes at either end of a row, driven just below the height of the peony stems, double up strong garden twine, loop around about 2/3 up the stake, wrap the twine once around, end-to-end and pull tight [don’t worry it loosens up a bit ] through the loop and slip knot. Voila, no mo flop. The stakes and twine hide well. Thanks for the tip, Marc, sounds like a good idea!